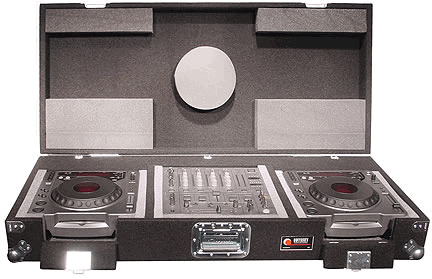 Odyssey CPi6800 Brand Specific Coffin Carpeted DJParts - All Variety of Parts that DJ Needs. The carpeted CD player console holds 1 Pioneer DJM-500 or DJM-600 mixer and 2 Pioneer CDJ-800 CD players. External hardware features steel ball corners and flip-down entry panels for the front loading CD players.